OK, I did it. I cooked asparagus, and I even liked it. Yes, there I admitted it. I even called my Mom and told her and Dad about it. They thought that was pretty funny. Dad said I was finally growing up. I also learned something about my "dry-roasting" cooking technique. I first tried it when I did the jerk chicken , and again when I did the pseudo-Indian chicken. The basic idea is that a dutch oven cooks by trapping the steam and the heat. The heavy lid traps all the moisture in. That's great with almost everything you cook, but once in a while, you want to cook something that's a bit dryer, something that sets seasonings in a glaze or something like that. You don't want to trap the moisture. I don't know what to call it, so I'm calling it "dry-roasting". To make it work, you put something under the lid to lift it up. I found a thin metal grill that I could place under the lid. It lifted the lid, but not much. That way, the moisture escaped. I found, however, that a lot of the heat did, too. I'm sure that the fact that it was a windy and cold day today didn't help much, either. But in order to make it work, you have to up the coals SIGNIFICANTLY. I put a thermometer in the bottom of the dutch oven while I was cooking the potatoes, and found that I needed to almost double the coals in order to get the kind of heat needed. I liked the results of cooking that way. It does lose a lot of heat that would have normally been trapped, however. In the final baking phase: 10-12 coals below, 18-20 coals above. I started out by lighting up the fire. That was a bit of a challenge as windy as it was, but eventually I had coals getting white. While those got ready, I got to cleaning the potatoes. The original recipe I drew this from called for baby potatoes. That would have been yummy. But I didn't have any. So, I used regular potatoes, quartered and then sliced in the cube-like chunks. I put them in a bowl, and dashed over some olive oil, then all of the other seasonings and flavorings. I shook it in the bowl and mixed them all up. Then I went out and put the oven on the coals to pre-heat some. I spritzed a little extra oil in the bottom. I don't know that I needed to, but I did. Once the oven was a bit hot, I put in the potatoes. I let those cook for a while, using the dry-roasting technique described above, until they got good and seared on all sides, and the seasonings were clinging to them. Since I was playing with the temperature, it took a little longer, but I think in normal conditions, it should take about 30 minutes or so, with a couple of stirrings. While that was happening, I was preparing the asparagus and the salmon. The asparagus was easy enough. I cut off about the bottom third of the asparagus, 'cause I remembered the bottom being the nastiest part when I was a kid. I put the sprigs into a bag with just a splash of oil and the salt and lemon stuff. I didn't have any lemons today, so I just used lemon pepper. I shook it up to coat the asparagus sprigs. Then, I cut the salmon fillet into four big pieces (that's how many would be eating). I sprinkled on the dill, scattered over the chopped green onions, and put a lemon slice on each one. Actually, today I used lime slices, 'cause that's what I had handy instead. I took all that out to the ovens. I took off the lid and the grill separator, and added the asparagus to the now delicious looking potatoes. and stirred them together. I laid the salmon fillet pieces in on top of those, and put the lid on solid. I readjusted the coals as above, and began baking the salmon and asparagus with the potatoes. Because it's still quite hot, it didn't take long to cook the salmon, maybe only about 15-20 more minutes or so. At that point the asparagus was "al dente", as my Dad said. It was definitely cooked, but it wasn't wilted. It was still a bit cruncy, resisting your teeth a bit. The oil had kept the seasonings tight to the stalks, and tight to the potatoes, so those were quite yummy, and the salmon was delicious, too. This meal really turned out four-star, if I do say so myself. I went to Smith's Grocery Store. I walked in. And I actually paid my own good, hard earned money for a bundle of asparagus. What is this world coming to?! Pleeeeease, please. Don't tell my mom! In 1990 President George Bush (the first one) raised up a big row by declaring to the world that he hated broccoli. He said, in essence, that he'd always hated it as a child, and now that he's the president, he wasn't going to eat it any more. It was one of the few idealogies that he and I shared. There were actually quite a few foods that I grew up hating. Broccoli was one. Squash was another. My mom is actually an excellent cook. But this was one dish she served up that was horror on a plate. Her squash was this boiled, puree'd glop of orange and it tasted gross and had a texture that was like melted modeling clay. Liver was another one I couldn't stand. Asparagus and I were bitter enemies, however. I loathed the slimy sticks of bitterness. They could fill my soul with ugliness like no other vegetable could. I hated them so much that one day I was possessed to actually trample my mother's asparagus patch. Many years later she and I could laugh about it. Not on that day, however. Mom and Dad had devised a deal they offered us. We could pick one food, one item that for the whole next year, we didn't have to eat. No matter how often it was cooked for us, we didn't have to touch it. The tradeoff, however, was that we were obliged to eat everything else with dignified and calm acceptance. I almost always chose asparagus. And I have a very hard time believing that I ate everything else with dignity and calm. Well, the last week or so, I've been contemplating my now-annual Mother's Day feast. I've been thinking about what to cook for it. For the meat/main dish, I've been seriously considering a pork crown roast. I mean, for sheer "Wow", there's not much that will beat a crown roast. And in one of my dutch oven cookbooks, there's a recipe for one with this mushroom and asparagus side dish. Everything looks just great, except for those blasted asparagus. But, you know, when it comes to making a plate look high-class, there are few veggies that will dress it up like asparagus. In the years, I've managed to make peace with broccoli. I don't mind it, now. I still don't like liver and squash. Sweet potatoes, not so much, either. Everyone tells me that good asparagus relies on the method of cooking. But see, my mom was a great cook, and I have a hard time believing she'd done it wrong all those years. I mean, Dad loved it, and even my sister grew to love it. What's wrong with me? So, should I swallow my pride and swallow the asparagus? And while you're contemplating that one, tell me about your most hated foods as a child. Did you ever grow up to like them? PS. In other news, I've been asked by our Ward Relief Society (the Women's organization of the Church of Jesus Christ of Latter-Day Saints), to do a dutch oven cooking demo. I'm pretty excited, and so is Brendon. I think we're going to do my Chicken/Onions/Potatoes meal. Last week, I made the Dutch Oven Seafood Chowder, and I also blogged about it in my other blog, Mo' boy, when I talked about Church Food. It was kind of an overview of the LDS Church Welfare system from my perspective. Well, yesterday, I did another dish of the same sort of thing. A frugal dish, made from staples, that tasted delicious. One of the things that they do as you start to get food assistance, is they give you this recipe book. It's full of really good basic recipes of dishes you can make with a few simple ingredients. It's got a lot of good advice on just simple cooking skills. Like, if you're used to just pulling out the bisquick to make biscuits, then you can use this recipe book to mix up your own bisquick. Really good solid stuff. In other words, they don't just give you food, they also hope that you'll learn a bit more about how to cook it, so you're better prepared to take care of your family. Anyway, I was flipping through this recipe book, and there's some really cool stuff in it. I came across this recipe for "Apple and Orange Pork Chops". Well, it turns out that we didn't have any pork chops, but we did have chicken, so I redid it. I can never leave a recipe alone, of course, so there are some extra herbs and spices in it, too. It was also a lot of fun because Brendon and his friend helped me prep the food and cook it. This is actually a very easy dish to make. You do it in two steps. First, I partially thawed the chicken and lit up the coals. I think it's a little easier to slice and dice chicken when it's still partly frozen. That's just me... I had Brendon and his friend start on the chicken, while I sliced up the onions. One of these days I'll blog about the many ways I've seen to slice up onions. They actually handled the knives pretty well. That would be another good topic for a blog posting. How to use a knife. There are a lot of good YouTube videos on that. That's how I learned. I also showed them how to split open the garlic with the flat of the knife and they thought that was really cool. Mincing it by rocking the knife was fun, too. Then we put the onions, the garlic, and the chicken in the open pot on the coals, and let that start to brown. It took a little while. I recommend using more coals rather than less. While it was browning, the young chefs took a break on the trampoline. Then, as it was browning, it was time to work on the other ingredients. We zested, then peeled the oranges. We separated them and diced them. We peeled the apples, then sliced and diced them up. Soon, the chicken and onions were ready. The onions were translucent, and getting a brown edge, and the chicken was cooked and brown. We put in the rice, the water, and the fruits, and stirred it all up. We pulled some coals from the bottom to put on top, and added more coals on top. I also had a side fire going to keep fresh coals for replenishing. Also, from this point on, we were cautious about opening up the lid. If you let too much moisture escape, then the rice doesn't cook as well. Then we went inside and chose up some herbs and spices. I think we did a pretty good job, but I think in retrospect I would have gone with a different set. I might have gone for the more "sweet spices", like nutmeg with the cinnamon. And maybe just a touch of cayenne for some edge. About 45 minutes later, it was done. Brendon's friend said it had a really cool chinese taste. I think that was because of the oranges. It was both sweet and savory. And the really sweet part was cooking with my son! I don't do so good at competitions, myself. In my practice runs before hand the food turns out GREAT. Then, when I go and actually compete, I fall apart. At least that's what happened at Eagle Mountain last year. What a mess! This last weekend at the International Sportsman's Expo in Sandy, UT, they had the annual IDOS World Championship Cookoff. In order to compete, you have to win a local, IDOS-sanctioned cookoff. I really wanted to be there. In fact, I had volunteered to be a cook's aide. But there was a Family Links conference for parents of disabled children that same weekend. My wife and I never miss that. Anyway, this year my hat's off to Tori and Terry Lewis. Here's an article about it, with their winning recipes. They won with a main dish of a crown roast. I'm kinda excited about that, because I've been thinking of doing a crown roast for this year's Mother's Day Feast. Congratulations to Tori and Terry! Today, I made Seafood Chowder. It would have been clam chowder, but we were out of those little cans of clams, and instead we had the little cans of crab and shrimp (about the size of tuna cans, you know. Same stuff). What made it very interesting was that I made it without a recipe. With only my brainz as my guide. It was very exciting to fly without a net, so to speak, and to have it turn out so well. I used the Roux base that Steven had shown me a few weeks ago, and just treated it a little bit differently, since I wasn't making a cheese sauce. I know, I know... Once I get a hold of something hot, I don't let up, do I? Anyway, since I didn't have a recipe, I'm just going to talk you through it. The first thing I did, after lighting up some coals, was get out one of my smaller dutch ovens and get it on top of about 15 coals or so, so it was getting good and hot. Into it, I put a half of a one-pound package of bacon, cut and separated into little squares. That started cooking. Once that was going, I got out my 12" dutch oven, which was the one that I was going to do the actual chowder in, and got it on some coals, probably closer to 20. I had diced up some onions, and minced up some garlic (a couple of cloves) and I got that browning in that 12 dutch oven. At this point, there were no lids on, and, obviously, no coals on top. While that was cooking, I was in the kitchen, quartering and slicing the potatoes, and slicing some celery. I did about four potatoes, and three or four stalks of celery. Pretty soon, the bacon was nice and crisp, and the onions were starting to brown. It was a pretty cheap grade of bacon, so there was lots of grease left in the smaller dutch oven. I pulled the bacon out and put it in with the onions, and left the drippings. To that, I added some flour. You don't want to add it too quickly, because you could easily add too much. I added until it was a little runnier than cookie dough. I just let it cook. I wanted to see what happened as you cook a roux longer and longer, so I let it go for a while. It gradually got more and more brown. Finally, I saw that it was getting nice and tanned, so I pulled that dutch oven off the coals. In the meantime, the onions, garlic, and bacon were still browning nicely in the other dutch oven. I added a pint carton of cream, and about half that much of milk, maybe less. To help it to boil, I put the lid on. Once it was boiling, I added the potatoes, the celery, and three little cans of seafood, with the liquid. I figured the seafood stock in the cans would enhance the flavor. Once it was boiling again, I added some of the roux, about a tablespoon at a time, stirring vigorously to break it up in the soup. I watched carefully after each tablespoonful of roux for a minute to check the thickness before adding more. If it goes too thick, I guess you can always just add more milk, but I don't want to catch myself adding and adding to catch up with myself over and over again. Pretty soon, it's nice and thick, but still more of a soup than a sauce. You can make it how you like it. At that point, I added some parsley, some salt and pepper (to taste on all three), and also some lemon juice. Then I pulled some of the coals out from under so that it would go from boil to simmer, and put the lid back on. I would check it about every 15 minutes, just to check the taste and the done-ness of the potatoes. It didn't take long, maybe 45 minutes to be done. While that was happening, I made some homemade bisquick and then some Red Lobster-style garlic cheese biscuits in another 12" dutch oven. I'll write about those tomorrow or Tuesday. OK, so I've done sourdoughs and ryes and all kinds of "hearth breads", whatever that means... But the crusts are tough (or should I say, "crusty"), and the crumb is heavy. Now that's not bad when you want a really hearty chunk of bread for a meat-based sandwich. But I also want to learn how to make something light. I want something I can make a PBJ on and have my kids eagerly eat it. I've learned a lot baking breads these last few months (heck, the whole last year). So, I though I'd give an old recipe a try. It's the one that my wife usually makes. I started by activating the yeast. I mixed the hot water and the honey (that cooled the water significantly), then added the yeast. While it was proving and frothing, I gathered up all the other ingredients. Then I just mixed all the rest of the ingredients in. One of the big things I've learned about breadmaking is to make sure that I knead it enough. This recipe passed the windowpane test quickly, in only about 10 minutes of keading. I've notice that when I've kneaded enough the dough is stiffer, also. Then I put it in the oiled bowl, and sprayed it with oil, and finally covered it with plastic wrap. It rose up pretty nicely. I gave it a little over an hour. When that was done, I punched it down and divided it into four doughballs, like loaves, and set them in the Dutch Oven to proof. This is where it almost went south. After about a half hour of proofing, I went out to light up some coals. I don't know what was wrong. Maybe the coals were damp, but I could NOT get coals to light up and burn hot. After trying for literally an hour, I put what few coals I had lit onto the Dutch Oven lid to preheat it. That's another very important thing I've learned about dutch oven breadmaking. In the meantime, I lit up another batch of coals. That was slow lighting, too. Finally, I got some coals lit, and I put them under the Dutch Oven and a few more on the lid, but I could tell it wasn't hot enough. By that time the bread had risen to above the lid line. I kinda punched it down a little with a fork before putting on the hot lid. I kept working on the coals, and after lighting more and a lot of fanning, I got some glow goin' on. It finally did cook, but the top was really brown. Not quite black, but really close. I brought it in to cool. I don't know if it's a good idea or not, but I let it cool in the Dutch Oven. I think the oven cooks it a little bit more while it's all cooling down. When it was all done, and I pulled it out, the crumb inside was cooked all the way through, and it was nice and soft, not doughy at all. The crust was dark, but still soft to my bite. In spite of all the troubles, I had baked my first truly successful sandwich loaf! Now, where's the butter and honey? I tried making this a long time ago, but I didn't blog about it because the sauce was absolutely horrible. It "broke". That means that the cheese ended up in a coagulated mass, and runny milk. Yuk. It was one of my worst tanks. So, today, I thought I'd try it again, now that I've learned how to do sauces better. I'll have to warn you, the way I did this, it was a very complex process. It's not for beginners. I started in the morning, and it all ended at about 5:00. Of course, there was a lot of down time in the middle. Still, there are a lot of steps. I started early in the day by putting some coals under my 8" dutch oven, with all of the ingredients in the first set. I put the lid on, and let it boil down until the spinach greens were soft. Actually, I did that using the coals on top of my 12" as it was cooking the cinnamon buns that I'll be writing about soon. Once that was boiled down and all the greens were soft, I took them out and put them in a collander to drain, and cool. Once they were cool, I put them in a bowl and added all the other ingredients, and stirred it all up. I put that in the fridge, covered by plastic wrap. The tortellini I made using the method I used for the pasta fresca a long time ago. It was a little different this time, though. I didn't use any water, and I kneaded it a long time. Probably about 12 minutes. 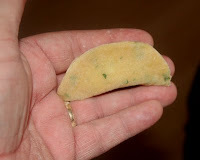 I was surprised that, once I was actually making the tortellini, it was much easier to work with the dough. It was more flexible. Are you noticing a trend, here? 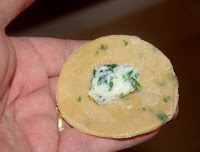 I used a small kids cup (with a diameter of about 2") to cut the discs for the tortellinis. This made them pretty big, but that's OK. They were easier to work that way. One thing I'd recommend, is that once you've used the cup to cut the discs, gather up the extra pasta and ball it up. Put the discs aside, and roll out the extra. Cut more discs, and carry on that way until all the dough is used up or you have enough discs. Plan on about 10 tortellinis per serving. Then I held a disc in my fingers, and put about a half teaspoon of filling into it. I wet the edge of one side with my finger (dipped in water), and folded it in half. I closed it up, pinching as I went. I had seen a TV show about making potstickers, and it said to press the edges together, starting where the filling is, so there's no air pockets. 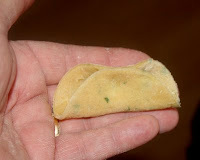 Once it's all sealed in a half-circle pouch, I bent each corner inward, and made the little "hat" that's tortellini. Once I got going, it went pretty fast. I just set them aside and let them dry a little bit. I started by sauteeing the first set of ingredients until they were quite browned. This actually took quite a long time. Then I pulled them out of the oven, and poured in the cream and the milk. I put the lid on and let it start boiling. Then, as my Brother-in-Law had shown me , I started adding in the roux I had left over (stored in the fridge) from last week. I stirred it in with a whisk, and just kept adding it until it was thick enough. I'm estimating the amount in the ingredients above. Once it was thick, I added the onions and the mushrooms back in, and added in the remaining ingredients. I kept whisking, and stirring, just to keep it going. It was great, and it didn't "break", just like last week. In the meantime, I had another 12" dutch oven with about 18-20 coals underneath cooking some links of mild italian sausage. I also had my 10" dutch oven, with 15-18 coals under it. That one was boiling water for the tortellini. Once it was boiling, I put in the tortellini and let it come back to a boil. Once it was boiling, it cooked pretty quick, in about 10 minutes. After making all these elements, it was fun to finally plate it up and serve it. I dished up some tortellinis, poured on some sauce. Then I sliced up a sausage link, and put it on the side. Finally, I scraped some mizithra cheese on top. Yum!